Are you planning to redecorate a room with a bit of rustic or Western style? Add to the ambiance with a letter bent into shape with barbed wire. 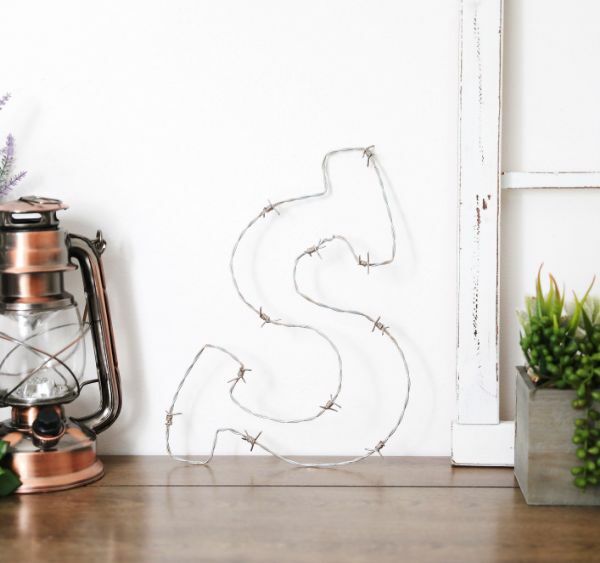 This tutorial shows how to create the "S," but you can use barbed wire to make any letter. Since this project involves metal with sharp points, crafters need to take safety precautions. Wear heavy work gloves, preferably leather ones. Cotton gardening gloves will not protect you. When you trim the metal, wear safety glasses. Place the finished project in a location inaccessible to children and curious pets, and be aware of the possibility of the barbs scratching walls or furniture. 1. Bend 2 inches of one end of barbed wire at a 90-degree angle (A1). Move along the wire 1 ½ inches and bend at a 90-degree angle (A2). 2. Go back to the first 2 inches. Position it so it's horizontal. Bend the metal upward at a 90-degree angle at the midpoint. 3. Return to A2. Move along the wire 4 inches. Bend the wire at a 90-degree angle. Move along the wire 1 ½ inches and bend at a 90-degree angle. Move along the wire 2 inches and bend at a 90-degree angle. 4. Make an S shape with 20 inches of the remaining barbed wire. 5. Bend the wire 90 degrees down at the top of the S curve. Move along the wire 1 ½ inches and bend at a 90-degree angle to the right. Move along the wire 4 inches and bend at an upward 90-degree angle. 6. Move along the wire 1 ½ inches and bend to a 90-degree angle to the left. Move along the wire 2 inches and bend downward at a 90-degree angle. 7. Bend the remaining wire to the left at a 90-degree angle. 8. Make an S shape with the remaining barbed wire. 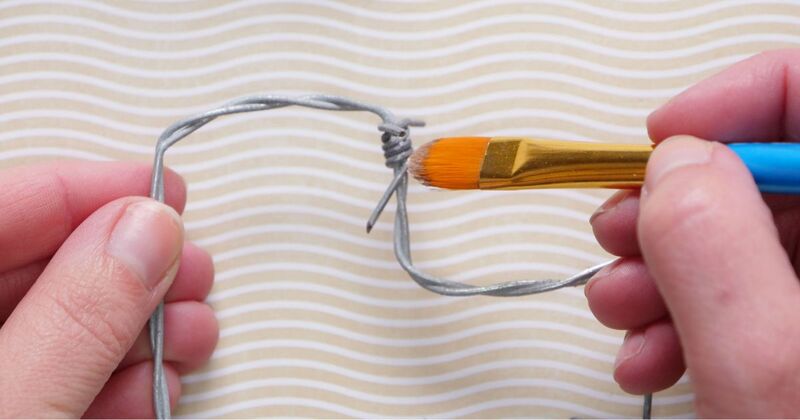 Cut off most of the excess wire and twist together the ends of the barbed wire. 9. Reshape the S to your satisfaction. 10. Put some paint in a small bowl. Set the letter on a paper towel. 11. Paint the barbs (knots). Paint additional spots along the letter if desired. Let the paint dry. 12. Place the letter carefully on a shelf.